Fill the jar with water, leaving about 1" space at the top. Add a generous squirt of dish soap (approx. 1 teaspoon) and one or two drops of food colouring. Screw the lid back on securely and swirl it around to mix it. 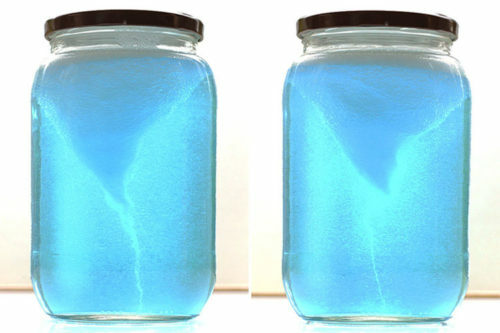 Swirl the jar in a circular motion as fast as you can until tornadoes form. If you're having trouble with too many bubbles, try adding 1 teaspoon of vinegar and using a spoon to scoop out the bubbles on the top.